Many years ago, there was this beautiful musical on Broadway that failed in an absurdly small number of shows: The Story of My Life. The failure, in my opinion, was not due to the book or the music, but because it wasn’t a Broadway show: it was a tender small musical that got lost in a gigantic house. I saw the show a few years ago at the Lillian Theatre (now Sacred Fools) in Hollywood, and it fit perfectly. I urge you to get the cast album for the show — you’ll find some of the best crafted and most touching story songs you have ever heard. 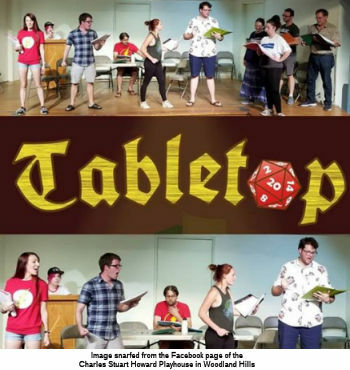 In 2014 the authors of that musical — book writer Brian Hill (FB), composer and lyricist Neil Bartram — developed another musical focused on the experience of college-age students, designed to be performed by college students. In a recent music purchasing binge, Amazon recommended this musical to me — The Theory of Relativity. I ordered it… and fell in love with another show. The music was extremely well crafted, the stories told by the songs were great, and a number of songs were just instant favorites. I thought nothing of it until I was reading the program during our recent visit to The Sirens of Titan. There was an ad for The Theory of Relativity being done at a small playhouse in Woodland Hills that we knew nothing about: The Charles Stewart Howard Playhouse (FB) on the grounds of Woodland Hills Community Church (at Canoga and Dumetz) in Harter Hall. I’m sure you can guess what I did when I got home. We went out to see the show last Sunday (excuse the delay in the writeup — a crazy week), and it was just a delight. Very simply staged — no scenery, just chairs — with 12 performers, it was essentially a song cycle about relationships. Most of the show was song, there were a few dialogue only pieces that added some additional characters or serving to tie everything together. Underlying them all together was the notion — and the question — of relativity: What makes a relationship? Is it the relationship as seen by the participants in the relative frame of motion? Is it the observations from the outside? Are relationships mathematical and precise, or messy and going against all logic? In going against logic, are relationships sometimes predictable? This was all wrapped up in some delicate and well-performed music, especially considering that this was at the level of community theatre (i.e., this was not an Equity-member cast; rather, there were some that had worked in a number of shows, and others for whom performing is more a passion than a career). I found the show to be extremely enjoyable. One of my favorite numbers in the show is “Me and Ricky”, a story about a woman whose first love was bad news. This was performed quite well by Caitlyn Rose Massey (FB). She could have used just a pinch more belt in the voice, but it was truly enjoyable. Another favorite number is “Promise Me This”, about Mira, the miracle baby and the relationship between a parent and their child. This was performed by Laila Abdo (FB), who just knocked it out with a strong clear voice and wonderful facial expressions. An aside about that: it was remarkable just to watch the faces of these performers, both when they were “on”, and even more so when they were “off” (that is, in the background just listening to another performer). “The End of the Line” is another fun number performed wonderfully by Paulina Logan (FB) and Tiffany Bailey (FB). Here, the cute lyrics dovetailed with simple but great performances by the actors to make something special. One of the most touching numbers was “Footprint”, about what makes a place a home. This was sung very well by Larry Collica (FB), who also served as Musical Director for the show. “Apples and Oranges” is a number that comes across very different on the album from on stage; the stage performance brings across a different meaning to the terms used. Chris Clonts (FB) and Daniel Koh (FB) handled the number extremely well, and I think their touching performance gave the number the something special that was needed. I’ll note that Koh had an extremely strong and beautiful voice. The multiple parts of “Pi”, performed by Kyle Sundman (FB), were cute, but they didn’t get their additional meaning until the spoke “Manicure” number featuring Katie Lynn Mapel (FB). PS: I loved Sundman’s Lego tie. Another set of paired scenes were the second number, “I’m Allergic to Cats” (performed by Justin Huff (FB)) and “Julie’s Song” (performed by Kristine Gilreath (FB)). “Cats” was really cute for its wording, but Huff’s performance of it was touching to those of similar nature (like me); when paired with Gilreath’s song and her wonderful look, it was magical. Mackayla Hill (FB) primarily only had a series of scenes about a cake (which were cute); but I actually noticed her voice more in the ensemble numbers, where there was quite a bit of power in that package. Kaiya Cheyenne Wynn (FB) was featured in a number of numbers, notably in the opening and the closing. A very nice strong voice, again, which I noticed even more in the ensemble numbers. One thing notable about this show was the variety of the cast. Often, your stage productions have casts with a similar look to them. This cast was extremely diverse in color, size, style … and it worked to make an important statement of its own about the diversity we see in relationships. Another cast point that I mentioned above was the facial expressions. Especially in a small musical like this where you can be up close with the performers: watch the facial expressions. Here, they were spectacular as the messages of the songs clearly resonated with the performed, and thus were amplified by the ensemble and carried out to the audience. Turning to the creative side of the production: Stage Direction and Choreography by Marshelle Giggles-Mills (FB). I’ve noted the set was simply a bunch of chairs moved around and a small platform up front; there was no other real scenery. Dance was simply and more movement, but it worked. There was no credit for costumes or hair design — presumably, these were picked by the actors from their personal wardrobes, demonstrating yet again the diversity in this team. Musical Direction was by Larry Collica (FB) on the piano. The production design was by Jessica Worland (FB), who also served as stage manager. The Theory of Relativity was produced by Suzanne Ryan (FB). 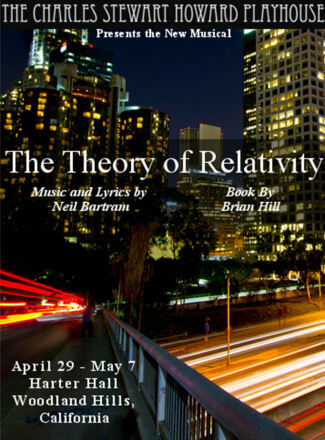 The Theory of Relativity has one more performance weekend — May 6 and 7. Tickets are available through the CSHP’s Brown Paper Tickets website; use the code “einstein” for a discount. Discount tickets may also be available through Goldstar. I enjoyed the show very much, and recommend it. Upcoming Shows: May starts with My Bodyguard at the Hollywood Pantages (FB) the first weekend. It continues with Martha Graham Dance and American Music at the Valley Performing Arts Center (VPAC) (FB). The third weekend brings the last show of the Actors Co-op (FB) season, Lucky Stiff, at Actors Co-op (FB). May concludes with Hello Again at the Chromolume Theatre (FB), and hopefully Five Guys Named Moe at Ebony Repertory Theatre (FB). As for June? Three words: Hollywood Fringe Festival (FB). I’m working on the schedule for that now. Look for the theatre plans for the third quarter of the year (July through September) in my next writeup.